More and more business groups at Microsoft use Power BI to generate insights and drive data-based decision making. To keep up with the modern pace of business and a workforce that is always on the go, interactive Power BI data needs to be available to view and share from any device, anytime, anywhere. To extend the visualization capabilities of Power BI and improve the user experience, the BI team at Microsoft created innovative solutions for Android, iOS, and Windows devices that provide an optimized dashboard and reports for mobile devices. Before Power BI mobile apps, developers had to create individual BI applications for specific devices and scaled down for smaller screens. Even though data was hosted on a SharePoint site, it didn't mean that data was viewable, manageable, and flexible enough to be accessed from a handheld device. It took a long time to create special views and custom applications, and the result often didn't include inherent data management capabilities. Users might be able to view red/green/yellow alerts on their mobile device, but they could not effectively work with the underlying data. 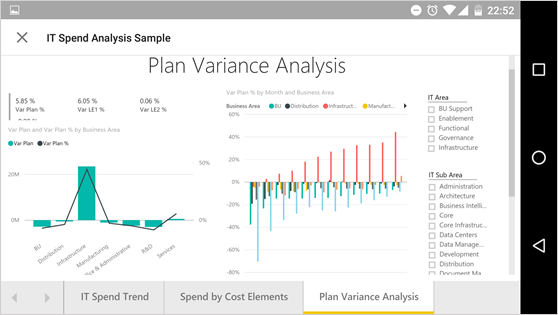 At Microsoft, Power BI is used to gain and share business insights with rich visuals. It helps our users stay informed, find answers quickly, spot trends as they happen, and make decisions faster. With Power BI on the web, our employees can monitor important data from across the organization and from all of the apps they rely on. Power BI mobile apps take that capability a step further by delivering device-specific visual enhancements and other features that help all Power BI users monitor their business, share views, and get fast answers using an interactive dashboard and report layouts that are optimized for small screens. 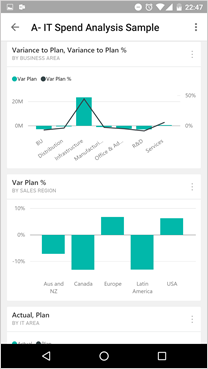 With the Microsoft Power BI mobile app for Android, iOS, and Windows Phone, users can now easily view and interact with their business data. "The mobile apps are very useful for us. The improved speed and accessibility of the Power BI mobile apps has improved our agility and is helping us rapidly respond to data fluctuations. Obviously, the mobile form factor is also a great advantage when on-the-go." One of the main channels used to deploy the Power BI mobile apps at Microsoft was the Microsoft Elite program. Microsoft IT created Microsoft Elite to transform the culture of early adoption through social channels and leaderboards. Microsoft IT has always been a "first and best customer" by deploying new products and technologies internally before they are released to the public. Employees who participate in early adoption programs at Microsoft give valuable feature validation and feedback to product groups, and they influence features and product direction. Microsoft IT built a base of sustained and engaged participants who help the BI team ready their mobile apps for release. There were 2,500 early adopters of Power BI Mobile apps at Microsoft. Overall, user feedback was good, and the features that rated highest among user at Microsoft included sharing, the Favorites tile area, editing favorite tiles, and inviting people to dashboards. For more information about the Microsoft Elite program, read Reenergizing early adoption by using SharePoint Online and Yammer. In addition to having live access to dashboards, reports, and KPI monitors while on the go, Power BI mobile app users have additional ways to interact with data and share information from their phone or tablet. Power BI brings together data from different data sources and presents it in dashboards. 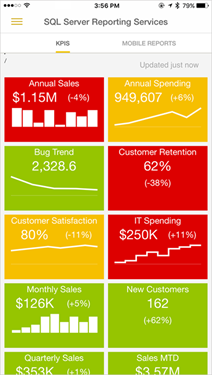 Dashboards are a single place to monitor the current state of the business. Power BI mobile apps give a better dashboard experience for mobile devices. In the Power BI mobile apps, users can explore the same dashboards that are available in Power BI. The dashboards refresh in real time, automatically, and can be shared. While dashboard tiles give you a quick overview of vital information, the reports behind the tiles provide a more in-depth view of data. It's a multi-perspective view that represents different insights. With Power BI mobile, reports are fully responsive and touch-enabled, featuring a layout that adjusts to the orientation and screen size of the device. Report drill-through and KPI monitors are available at a tap. In addition to providing access to your cloud-based Power BI data, Power BI mobile apps also work with on-premises Microsoft SQL Server 2016 Reporting Services (SSRS), allowing you to seamlessly bring your on-premises data to your mobile device with out-of-the-box mobile reports and KPI tracking. Using the Power BI mobile apps, you can view your dashboards from Power BI and your KPIs and mobile reports from SSRS—all in one app. You can send snapshots of tiles to anyone, not just your colleagues. When you share a snapshot of a tile from the Power BI mobile app, recipients can see the snapshot of the tile exactly as you do. They can't open the dashboard. You can add annotations including lines, comments, or stickers to a tile before you share the snapshot. Data sources are often set to refresh daily, although they can also be manually refreshed. Using Power BI mobile apps, you can set alerts to notify you when data in your dashboards is refreshed, or if the new value is above or below the limits you set. Alerts work for tiles featuring a single number. Only you can see the data alerts you set, even if you share a dashboard or a snapshot of a tile. QR codes in Power BI allow you to consume information and insights in the physical environment and context. QR codes in Power BI can connect any item directly to related BI information with no additional search. You want to share a dashboard with a colleague, so you create a QR code for a tile in the Power BI dashboard. You can include the code in email or share it in a key location. In manufacturing, a QR code can be posted on a machine in your factory to provide instant access to its real performance data, shown in a Power BI dashboard. You can include a QR code within a PowerPoint presentation, so others can scan and grab a live reference for the information being presented. Microsoft Power BI mobile apps extend the capabilities of Power BI and give thousands of users at Microsoft a way to stay up-to-date on critical business information and explore insights as they happen. Busy users can present their data in new, visual ways with interactive charts, maps, and graphs enhanced for mobile devices. Users across the company are still discovering new scenarios where Power BI mobile apps improve collaboration and mobile productivity daily. "Power BI mobile apps provide instant access to the dashboards that report on our service reliability and health. I can easily send tile snapshots to other members of my team to keep them informed. Threshold alerts are very useful in bringing changes in status to my attention in real time." Note: Power BI mobile apps are consistently evolving. We aim to bring all major capabilities into all of our apps, but at the time this article was written there were minor differences between app capabilities on each platform.